A few weeks ago, I had the pleasure of taking eight of our tween/teen girls from church to this year's Ultimate Sleepover. This is a girls' event hosted each fall by the State Convention of Baptists in Indiana. We had a ball, as our time there was spent with faith AND fun. I was fortunate to get to teach two breakout sessions this year: "My Strange Addiction" (about harmful behaviors that we often set up as idols above God) and "Netiquette" (regarding how to have a safe, aware, and God-honoring online presence). What an experience that was! And although many may begrudge opportunities to get LESS sleep (away from home and on a Sunday School floor, to boot! )...I love them! Times like these allow for some deep and meaningful convos that often lead to real growth and change. And since I feel teaching young women is the "sweet spot" of what I am called to ministry-wise, weekends like these really enliven me. PLUS, my friend Britt got to accompany our group as a chaperone, and she brought along her wee one that we got to love on. I gotta' say...it doesn't get much better than a weekend of girls' ministry, fellowship with a dear friend, and cuddle-time with a sweet baby. Anyway, I took a cue from Amy Davis this year and added a little twist to the overnight venture. Since she has been posting those 15 Minute Drawing Challenges over at the Mavis Davis Blog the past few weeks, I have really gotten into them. I feel like I can meditate on the Word of God in a unique way when I am creating something pretty with the passage. And I wanted to bring a bit of this to my girls. Since I wanted the girls to spend some quality time with that verse - getting to know it, study it, and dwell on it - I created a drawing challenge for them. 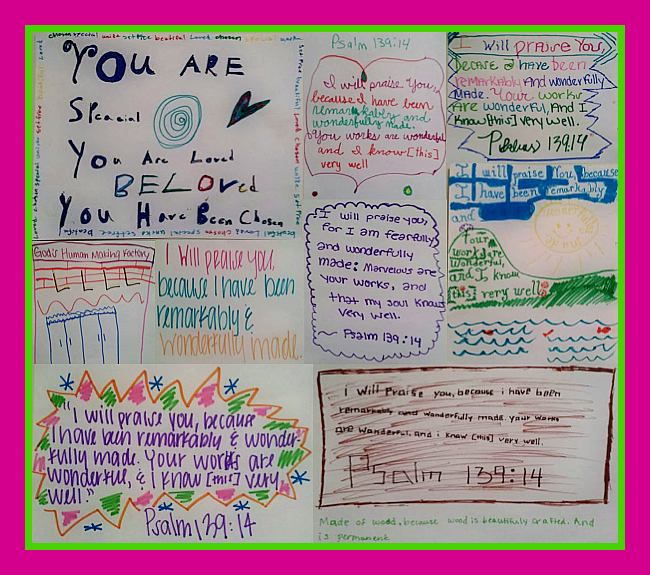 I brought paper and markers to the girls at about 11:30pm and had them illustrate the Scripture. Below is their handiwork. I think they did a wonderful job. Peruse, and be encouraged!